Boracay Island. You’ll be dropped off by the shuttle at Second Wind Bed Bunk & Breakfast or MNL Hostel. Take this time to explore on your own and get to know your new destination! Hop on a tricycle and make your way to Ariel’s House. Make sure to be there BEFORE 10:30 am for your pre-departure registration. At 11:15 am, you’ll go on a boat cruise on a traditional Filipino outrigger boat known as Bancaca beyond the shores of Boracay. A stark contrast to the famous White Beach, you’ll see the unspoiled coastline comprised of lush forests, deserted beaches, and volcanic rock. The boat ride lasts 35-45 minutes, depending on the type of boat used, and is the perfect time to make new friends and enjoy the start of your open bar! Get your day officially started with some heart-stopping, death defying cliff diving. 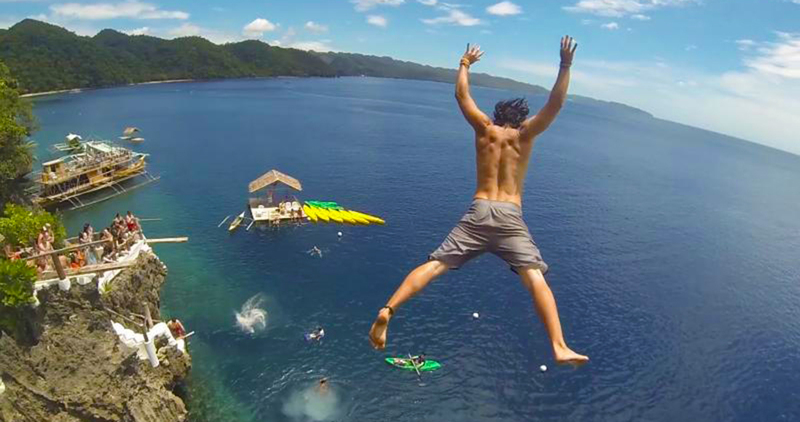 Huffington Post named Ariel’s Point as the perfect place to check cliff diving off your bucket list. With five different diving boards and platforms ranging from 3-15 meters, it’s not hard to believe. If you’re not yet ready for this, it’s okay. There’s a bamboo ladder and floating dock, for simply chilling out. Ariel’s Point’s protected location makes it the perfect area for kayaking along the unspoiled shoreline of Buruanga, a small coastal village on the island of Panay. Enjoy paddling to nearby deserted beaches or use your sit-on-top kayak as a mobile platform for cliff diving and nature photography. You might even encounter some flying fish or start a conversation with the local fishermen. Both single (one-person) and tandem (two-person) kayaks are available. Life jackets are provided and must be worn at all times. The beautiful seas of the Philippines are teeming with marine life. The coastline around Ariel’s Point is no exception. Clownfish, damselfish, starfish, and sea anemones are just a few of the fascinating species you might encounter during your underwater adventure. Some guests have even spotted sea turtles and dolphins visiting the area. Snorkels, masks, and life jackets are provided. Of course, you won’t go hungry! Enjoy a delicious buffet that includes fresh and traditional dishes such as grilled fish, grilled pork, barbecue chicken, longaniza sausages, pancit noodles (vegetarian), eggplant salad (vegetarian), herb potatoes (vegetarian), steamed rice (vegetarian), prawn crackers, and an assortment of fruits (vegetarian). The package also includes a late afternoon snack or merienda such as caramelized bananas or local sweet potatoes. Don’t forget! You can enjoy unlimited drinks during you visit to Ariel’s Point. Drinks include soda (Coca-Cola products), beer (San Miguel Pale Pilsen, San Miguel Light, and Red Horse), locally distilled rum (Tanduay or Old Captain), mixed drinks, and bottled water. Thank you for drinking responsibly. Boracay is known for its unholy never-ending happy hours, but the happiest of hours happen with a classic Boracay Pubcrawl! Hop through five bars and clubs, down 10 shots and shooters, and take advantage of the crazy Pubcrawl special discounts. Your Pubcrawl Party Captain will lead the way, and take you through some fun and funny get-to-know games. You’ll get your own Pubcrawl Shirt, a shot glass to get your free shots, and take some more, and a baller band to take as a souvenir. Objective: Party with an awesome group with VIP treatment! Time to nurse your aching head! Your whole night partying will definitely have you hungover and maybe have some body parts aching. Take this day to relax and chill out. Grab a fresh mango shake at Jonah’s, pick up a choriburger (chorizo burger) and just lie on the beach. Time to bid farewell to your white sand party island! You’ll be picked up at Second Wind Bed Bunk & Breakfast or MNL Hostel to start your journey back to the airport. Just make sure to confirm with the receptionist at your hostel your flight details, so they can advise you on the best time that you can be picked up according to your flight. As your flight takes off and flies over Boracay Island, relax in your seat, and look out the window, and bid adieu to your home for what was hopefully some of the best 5 days! Ticket to join the famous Boracay Pub Crawl – biggest and best crawl on the island! Open date tickets are subject to availability, please give 7-14 days notice to book. All bookings must be reconfirmed 24-48 hours in advance. Due to conditions out of our control (such as weather conditions), One Life Adventures reserves the right to change the itinerary if necessary. Travel insurance must be provided either at time of bookings, or at least 2 weeks before departure.Travel insurance is compulsory even for the add-on trips. Boracay beach is one of the most famous destinations in the Philippines and for good reason – it’s stunning! So grab a cold beer and join this epic 5 day Boracay Beach Party Pack with the team of One Life Adventures which gives you everything you need to enjoy the sun, fun and late nights that this Filipino hotspot has to offer! Your pack includes airport transfers, dorm accommodation just a short stroll from the white sand beaches, a ticket to join the Boracay Pub Crawl and even a day trip to the infamous Ariels House – where you’ll enjoy an open day all day (seriously! ), cliff jumping and some incredible snorkelling. It’s 5 days filled with good times in a tropical paradise! Mad Monkey Adventures is operated by award winning travel blogger Chris from Backpacker Banter & Mad Monkey Hostels. Together with the awesome team at Mad Monkey, one of Asia’s leading youth travel companies with hostels in Cambodia, Thailand, Philippines & Indonesia we are here to you put together your dream trip and make the most of some of the best travel destinations on the planet. We are always available to help you with any questions you may have, or if you need any advice. We want you to have the best experience possible, don't hesitate to hit us up. No Stress | No Worries.